Welcoming Michelle to the board, we discussed her desire to assist with the marketing team focusing on Social Media efforts and outreach. 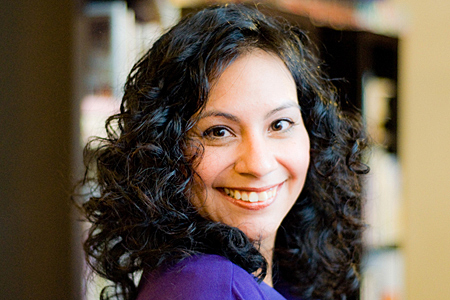 Regina Garay expressed a deep interest in developing our mentoring program begun last year. 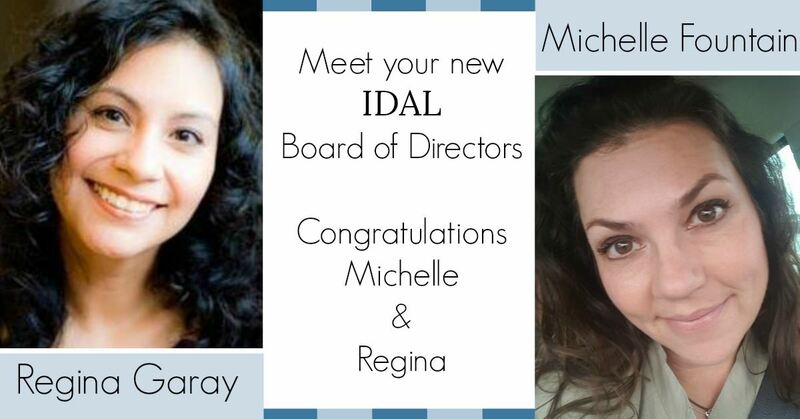 The IDAL board is grateful to both of our new members for stepping up and accepting the nominations. Our gratitude goes out to Donna Mock as well for agreeing to assist us with our mentorship program. Although not elected, as we only had two available positions, Donna was one of the first members to volunteer when the Mentorship program was announced in 2017 and still hopes to help develop new careers as a committee member. 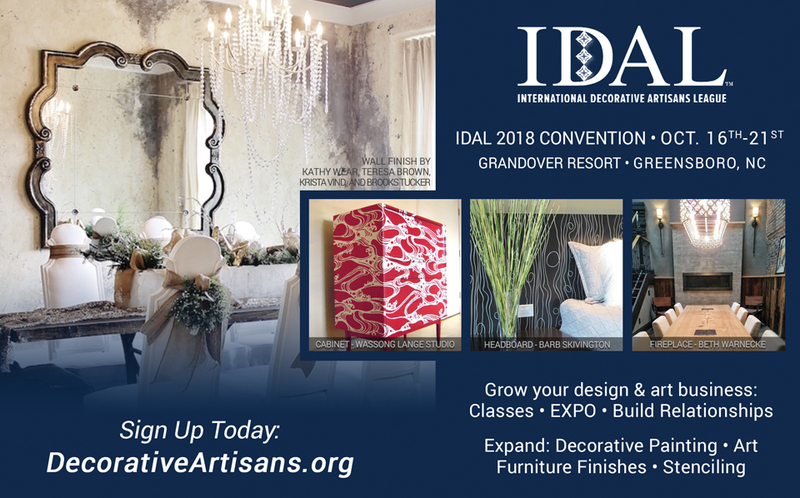 As we continue rebuilding and rebranding IDAL for the future of decorative painting, please consider any special skill set or interest you may have and are willing to share through serving on the IDAL National Board or as a Committee Member. It’s an exciting time in the history of our organization and we would love to have the opportunity to work with you! In welcoming our two new board members, this, of course, means we must thank Kathy Carroll and Rik Lazenby for their years of commitment and service to the IDAL membership. Kathy served as Treasurer, Convention Sponsorship and hosted and ran the IDAL office. Her industry knowledge, previous board experience and depth of contacts were extremely valuable assets she generously shared. Rik Lazenby, our southern leader, provided the board wisdom, charm and his calming presence. Under his leadership, we organized the first fully IDAL board run convention - Greensboro 2017, we believe in over ten years. Only past board members can understand what it takes to achieve such a feat! We are grateful for his patience and vision. We look forward to working with our two newly elected board members and the future committee members. 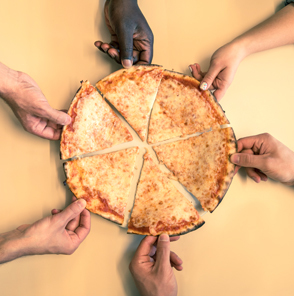 The old adage says that “Sharing is Caring” is as true in our modern day times as it was in less tech-obssessed eras. The sharing of information is key to social media success, whether it be sharing about your day, your interests, and/or your business niche. It’s the currency of social media! Sharing the right content is also important and while some people inherently have a knack for it, I have a few tips to help refine what you post. It could be a podcast, a video, or a simple striking image. The core of it is: does it make you say Wow? Would you email it to a friend? Do you think your network would thank you for it? Would YOU want to see it if someone else posted it? 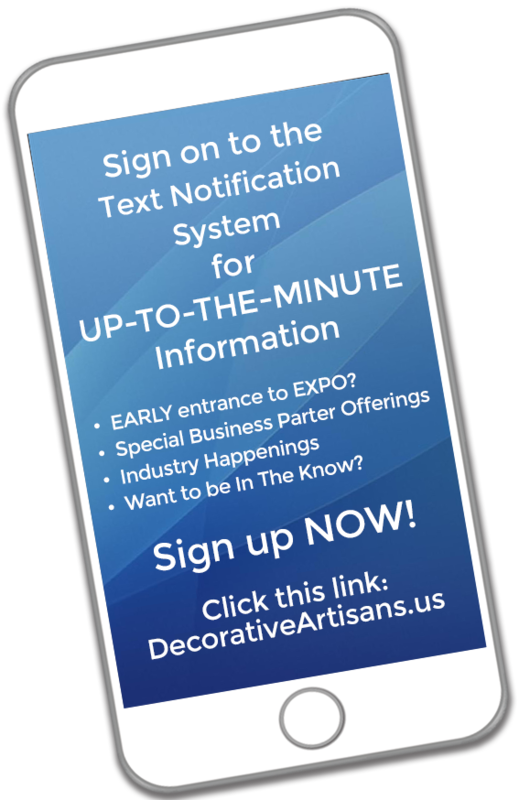 Is it something you want to promote and feel comfortable promoting? If the answer is yes, then by all means, share it. Share it with your thoughts on it or by sharing the ‘hook’ (say, an incredible statistic or a great quote from the article). It’s this truthfulness and honesty that will help encourage engagement and continue to find you a broader audience. For the most part, sharing a link to an article, video or podcast is fine to do, and I will usually list the publication/creator for credit and if appropriate, geotag the location. For an image, I like to have permission to share while also giving credit. There are a few people to consider giving credit to when sharing an image or a project: the artist, the designer, the photographer, the publication, and the writer and/or blogger. Not only is it the right thing to do, it’s also a gesture that can lead to more collaborative relationships, opportunities and projects. My network has expanded considerably simply by bonding over the love of a potential share. When confronted with an image you like but don’t know the source, try Google Images. Head to Google.com and click on Images (upper right). Upload the image that you are looking to share or paste in the URL using the camera icon on the search bar and go over the results. 9 times out of 10 I can find who to attribute it to and many times, I will email the person for permission to share with credit. If I can’t find the original creator, I will usually opt not to share it. Of course, posting your own informative, entertaining, and/or inspiring content also counts for amazing shares. The shares can be a list, a video, a how-to, a review, or simply project images. Whatever you prefer and feel comfortable with – say, live video - make it a staple for you and use a few supporting share types as well, such as images or blog post links. These can become more of your focus and as you continue, you will become more well known for these types of shares. I recently chatted with a friend and she was concerned that she wasn’t receiving any likes or comments on her posts. I asked her, “Do you actively engage with others on their shares?” and she looked stunned and said, “Actually…no. I guess I should do more of that.” YES – and here’s where I pull another adage: “It is better to give than to receive”. As you update your posting endeavors, be sure to interact liberally with the shares of others. Let people know when you love something, provide your own valuable feedback, and thank them for sharing it. With this, people will start seeing your name more often and you will build relationships with a like-minded tribe who will in turn, begin to appreciate your shares. Hope you’ve enjoyed this article – and btw, I am always looking for ideas on what to write about next. If you have something you’d like to know more about, 'share' it with me! I was hand-sanding a piece of furniture for a client. It was from a foreign country, so I have no idea what was on it. I was only “spot sanding”, so I did not put on my safety glasses. Later that night, I noticed that my eyes were burning, so I took a shower and tried to wash out my eyes out the best that I could. For the following two weeks, every time I would put my contacts in, I felt like there was a tear in my contact or something was in my right eye. It was on a Thursday night, and I was sitting in bed looking at my phone, when suddenly it felt like a 2 x 4 had flown into my right eye. I have never experienced a pain like that before! I suffered through the night, and called the eye doctor first thing Friday morning, as when I woke up, my eye was BLOOD RED, and swollen shut. They worked me in, and got me back right when I walked in the door and they saw the state of my eye. Long story short…..the debris from that piece of furniture had collected under my lid and had formed 3 corneal ulcers in my right eye. He immediately put me on antibiotic drops and put me to bed for the weekend in a dark room with cold compresses on that eye. I was not allowed to look at any screens (phone/ computer/ tv, etc) or be in sunlight for a week. The doc told me that most women equate the pain of corneal ulcers to childbirth…. I would have to agree!! He told me that had I waited until Monday to come in, that I would have likely lost complete vision in my right eye. The corneal ulcers have healed, but I am VERY lucky, because although they heal, they always leave a scar. I am fortunate that these are all above my iris, therefore will never be in my line of vision. 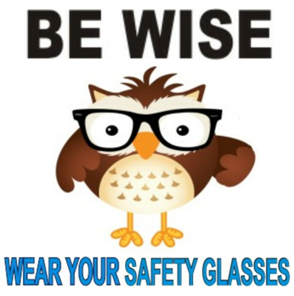 Needless to say, I have since ordered safety glasses in every flavor and form, and will NEVER be without them!! I want to share this with everyone, in hopes that this would never happen to any one of you! In previous articles I've referenced my entertainment background, but I never explained how I got started and did it full-time from 1995-2013...which is especially weird because I never even did so much as a high school play. But the reason is simple. Physical fitness. I was an athlete in high school and college, and though I'm certainly not a big guy by any standard, I was in decent shape, and strong enough to perform a lot of different roles. From wearing giant, ridiculously heavy character costumes to walking stilts and tumbling, my athletic background got me a lot of work early in my career. As I progressed as a performer, my strength helped me learn a number of different adagio and swing lifts, and eventually get into stunt work. And so it is with art. Think about how much of our jobs involve lifting heavy scaffold, carrying five-gallon buckets of joint compound, or simply working overhead and in small, confined spaces. It pays to be fit if you're an artist...literally. My mother (and business partner) and I often get referrals because we can take on some projects that our colleagues physically cannot. And speaking of my mother, she has been an artist for most of her life, and has tried virtually every diet plan in the world, to no avail. 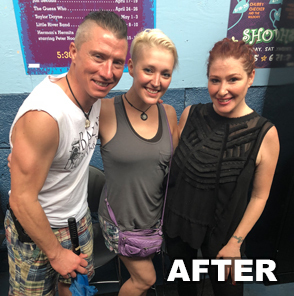 But, she kept trying, and just over a year ago she changed to a completely plant-based diet, and while she may be in her sixties, she looks like a different person now. Best news? This time it stuck. Now, I'm not going to try to get you change your diet to mirror ours. My wife and I (and now my mother, too) may have committed to being vegan, but we all pledge to not be THOSE kinds of vegans. But my point is simple. My mother gets around a lot better now, and while I try to do most of the heavy lifting, she can still sling up multiple sets of scaffold by herself if she has to. A lot of that is due to her fitness level. So, I urge you to take a moment and evaluate your own fitness level. Are you eating right? Are you getting enough exercise? Or even better, ask yourself what jobs have you done this year that may have been easier if you lost a few pounds or were a little bit stronger? Are you willing to work and invest in your business by hitting the gym, or maybe just start by skipping dessert? Because that's how it starts, and that's how you turn things around. But before you stop reading and mutter, “What does this meathead know about struggling with his weight?” know this. About eight years ago my wife (then girlfriend) and I were absolutely miserable. 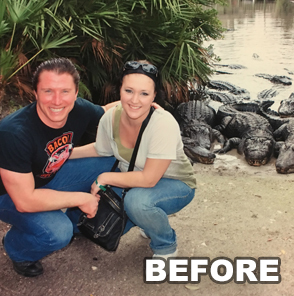 We were both overweight, not working out regularly, and had a host of other poor habits. We were basically staying together because we were dependent on each other to pay all of our bills. It was that bad. Then, one day, we just said, “This is not who we want to be, so let's change it.” Now... where I'm from originally, if you don't eat meat you get looks from people like...well, the way they look at you when they hear you're a dancer or a singer. And while our diet isn't necessarily for everyone, it certainly worked for us. But once I realized that a mid-western boy like me could give up chicken wings and pepperoni pizza, I learned I could quit a bunch of other bad habits. Gone was Diet Mountain Dew (you have no idea how much of that I drank), potato chips, sugar, and basically anything processed. And our lives slowly changed. We felt better, treated each other better, and girlfriend became best friend, then wife. Now, my wife, Ilona, and I get up pretty much every morning around 5am, go into our tiny home gym, and work out together. We look at it less like work, and more like time we get to spend together before we go our separate ways to actual paying work. But the two are completely intertwined. Everyone has struggled in their own way. But you can always turn it around, no matter where you are in life. Just ask my mom. The Jenny Craig diet didn't work, the Susan Powter “Stop the Insanity” thing didn't work, even Weight Watchers failed to stick, along with a host of others. But in the end it was my mom who finally said enough is enough, and she didn't need a gimmick. She just needed herself. And, I'm proud to say my wife is not just my best friend, but someone I look up to. She pushed so hard working out a couple of weeks ago she actually had to run to the bathroom and got sick. It was awesome. So, ask yourself, how hard you are willing to push, because even as an artist, it pays to be fit.